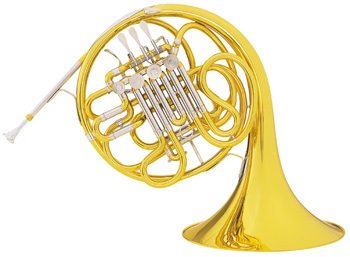 French horns are made in many styles so be sure you choose the right one to suit your needs. There are single Bb & single F French horns, ones specially designed for children, full size single Bb & full size single F, compensating double & full double, Triple, Bb/F Alto, the list goes on. They are also available with detachable or screw bells so that the case need not be snail-shaped & a little awkward to carry, but much smaller & possible to fit on an aeroplane's luggage rack. This is very important for pro players who would rather not get a bell crease on their expensive instrument by having to put in the hold. If you are unsure of the exact type that would suit your needs do phone or come into the shop & we would be happy to advise you.